Tremolo taken an awful lot further than your standard box. Goes way beyond standard tremolo effects. Delivers spectacular results. Setting up sounds is a little complex. 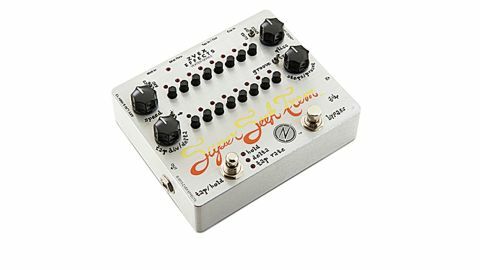 The Z.Vex Vexter Super Seek Trem uses a step sequencer to deliver the effect as a rhythmic pattern. "The pedal is designed to go beyond a standard tremolo to deliver the effects in complex patterns"
Effectively a step sequencer of 16 volume pots, the pedal is designed to go beyond a standard tremolo to deliver the effects in complex patterns. Basic operation sees your chosen number of volume pots set at a level between silence and full to create a tremolo pattern of your choice, while the speed of the pattern can be set with a knob or alternatively via a tap knob, MIDI clock input or connected expression pedal. On top of this, there are various other functions such as glissando, which sets a slide from one step to the next, either globally or for individual steps. Setting up sounds can be a bit complex, but the results can be spectacular, with many variations of hard or soft trem patterns - and you can store up to eight of them. In summary, there's loads to explore if you like tremolo but want more complexity.